With the awards season in full stride, this morning marked the announcement of a trio of guild announcements. Actors, producers, editors, and art directors have all already chimed in with their top picks for the best in cinema for 2014, and this very busy morning brought announcements from the Writers Guild of America, American Society of Cinematographers, and the Costume Designers Guild. This flood of announcements promptly turns the awards race onward to Phase Two of the awards season, where the industry starts to weigh in following the mad rush of critics prizes that dominated Phase One. Richard Linklater’s Boyhood has, for the most part, won that stake of the race earning top prizes from the New York and Los Angeles Film Critics, respectively, though Alejandro González Iñárritu’s dark comedy Birdman and Wes Anderson’s spring hit The Grand Budapest Hotel have both fared incredibly well with critics as well. The guilds are a different beast altogether however. So far, three films have been nominated across the board from the four guilds that have announced their awards (Birdman, The Grand Budapest Hotel, The Imitation Game), suggesting wide appeal that bodes well for their Oscar chances. Five other films have been mentioned in three of the four guild announcements – American Sniper, Nightcrawler, and Gone Girl missed SAG’s Best Ensemble category (though the latter two received acting nods for Jake Gyllenhaal and Rosamund Pike, respectively), Boyhood missed with Art Directors (it was ineligible), and The Theory of Everything missed out with film editors. The announcements together both cement and cloudy up what is turning out to be one of the more unpredictable Oscar years in recent memory. The biggest announcement today came from the Writers Guild of America. The WGA announced nominations for original, adapted, and documentary screenplays, solidifying Boyhood, The Grand Budapest Hotel, The Imitation Game, and Gone Girl as solid entries across the board. However, with the WGA list, there comes a few caveats. Each year, a notable list of films are deemed ineligible by the WGA due to either a film being produced through a production company that isn’t a WGA co-signatory or by the fact that it was written by a writer who is not a member of the WGA. Such films not eligible this year include a few heavy-hitters like Selma, Mr. Turner, The Theory of Everything, and perhaps most glaring omission, Birdman. The ineligibility of those films perhaps opened the door for films like Foxcatcher, and the oddest choice on the WGA roster, Guardians of the Galaxy. Surprisingly, the latter Marvel adaptation edged out Paul Thomas Anderson’s Inherent Vice for a nod. The American Society of Cinematographers announced as well this morning. Voted on by members of the Cinematographers Guild, they honored the five best achievements in cinematography for 2014. Birdman‘s Emmanuel Lubezki was nominated as expected and looks to be a top frontrunner with the Academy due to the films’ fanciful one-shot conceit. Lubezki won the ASC award as well as the Academy Award just last year for his work on Alfonso Cuarón’s Gravity. Somewhat surprisingly, The Imitation Game made the list, perhaps more as a product of industry love and respect over the film than anything else. Snubbed from the list includes notable achievements like Nightcrawler, A Most Violent Year and Selma. The Costume Designers Guild was the last guild to announce nominations on this very day. Notably, Selma, Ava DuVernay’s critically acclaimed account of the 1965 voting rights marches, broke through with its first guild mention of the season. In a stroke of better late than never, the Costume Designers nominated the fact-based drama in the period film category alongside awards season stalwarts The Grand Budapest Hotel and The Imitation Game. 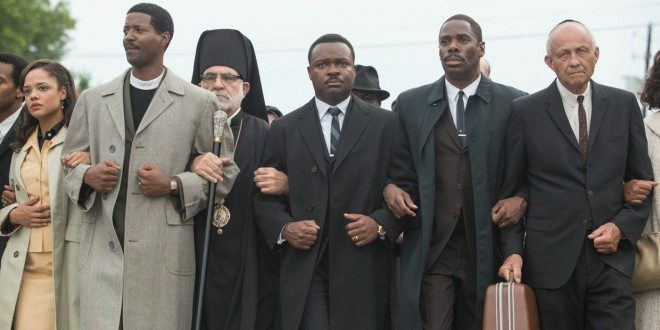 Selma was late breaking due to the film still in the process of completion for the majority of the start of the awards season, prompting guild members (aside from Academy members) not to receive screeners of the films. That has been the consistent reasoning for why the film hasn’t been nominated fully by the guilds.